The universally hated Werehog from Sonic Unleashed will live to see another day and cause more weeping and gnashing of teeth among what fans of Sega's mascot remain. Here's my advice to the old-school Sonic fans who continually cry foul when Sega inevitably besmirches their beloved franchise time and time again, despite all glimmers of hope: It's time to move on. The time has passed when Sega made Sonic games for you, they've moved on and it's time for you to do the same. Don't believe me? Sega themselves have admitted to it. Old fans aren't the core audience of the series. "You have the animated Sonic series that is intended for younger kids, and I personally like to look at those kids as our most important audience," Sonic director Tetsu Katano said in an interview. "That said, we're trying to make games which appeal to all generations." Some members of the older of those generations didn't find much appeal in the Werehog sections of the recent Sonic Unleashed, during which Sonic transforms into feral creature with Stretch Armstrong powers who likes to smash stuff. Katano will readily accept that people don't like the Werehog, but isn't quite ready to give them what they want. "In principle, I think that the users are always right. They're the ones paying the money and playing the games," he said. So if the users are always right, why not ditch the damn Werehog? "I don't think that producing the Werehog was a mistake per se, but there were a lot of things we could have done better if we had more time and resources." Seems Katano sees untapped potential in the Werehog, so much that he guarantees that we'll see the thing again. 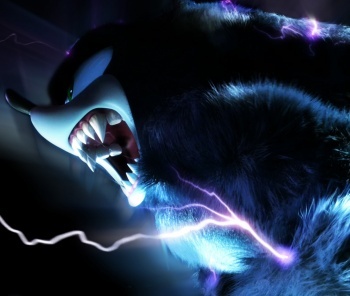 "If I think of any ideas [for improving the Werehog] then Sonic Unleashed 2 will be the time for that," he explained. "But you will see the Werehog again." Hopefully by "improvements" he doesn't mean the ditched "yeti Werehog" concepts from the first Sonic Unleashed.